Place the Australian Mount Zero beluga black lentils, one piece of ginger and half of the lemon grass into a medium-sized saucepan with four cups of cold water. Bring to the boil, then turn down to simmer until cooked (about 15 minutes). The lentils should still be firm in texture. Drain the lentils and put aside. At the same time, add the black rice, one piece of ginger and the other half of the lemon grass into a medium-sized saucepan with four cups of cold water. Bring rice to the boil, then turn down to simmer until cooked (20-30 minutes). The rice should be soft but chewy. Drain excess water and put rice aside. To make the dressing, add the lime juice, soy sauce, fish sauce, brown sugar and chilli paste to a jug and mix well. Heat a wok or large frying pan to high. Add the sesame seed oil and fry the tofu and sesame seeds for 5-10 minutes until the tofu is brown and crispy. Remove four large, cup-shaped leaves from the radicchio. 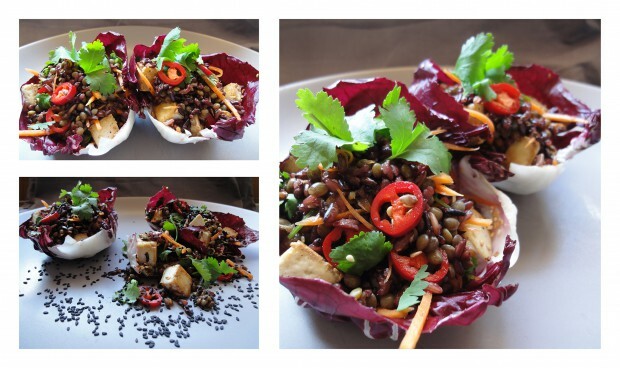 Place one quarter of the crispy tofu into each radicchio cup, topping with the lentil mixture. Garnish with the remaining coriander and chilli. Enjoy! Brown rice or brown lentils can be used if desired. Black sesame seeds make a lovely additional garnish! Serves 4 as a main course or 8 as an entre/side dish.